Take a few moments to experience richer Internet audio with these QSound products available through our 3D Sound Store. Hear the difference iQfx3 can make to your Internet audio. 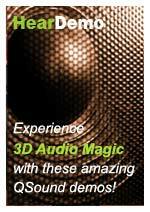 This amazing 3D audio Internet software, made exclusively for RealNetworks RealOne Player®, makes streaming audio and MP3s come alive with QSound's remarkable 3D audio enhancement effects. Discover today's most immersive Internet audio experience with QMAX®II, QSound's powerful audio effects software. Bring out the best in your favorite Internet radio stations and MP3s by transforming those flat, tinny sounds into a rich 3D audio experience that completely encircles you with sound.